Beautiful pet friendly cabin located near Pigeon Forge, TN. 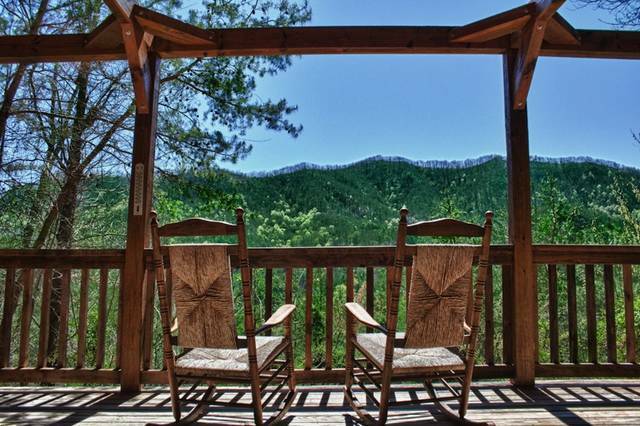 Plenty of room for a small family to enjoy a Great Smoky Mountains Vacation. 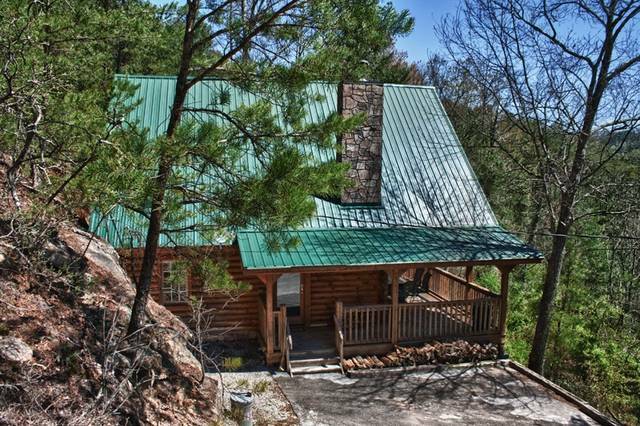 *****4WD, Truck, SUV or AWD is a must when traveling to this cabin. Walden's View is a beautiful 2 Bedroom, 2 1/2 Bath Pet Friendly Wears Valley Cabin Rental located just miles from downtown Pigeon Forge. This Smoky Mountains Cabin Rental is perfect for families looking for accommodations that allow them to bring their four-legged furry family members. Waldens View is located in the Waldens Creek area and is perched on a mountain side overlooking rolling hills and distant mountains. If you are looking for an excellent location to the Pigeon Forge attractions as well as the Great Smoky Mountains National Park, then Waldens View is an excellent choice! Main Level: You are going to love the Kitchen. It is magnificent! The cabinets are made of true reclaimed barn wood. Preparing meals for the family is enjoyable in this wonderful Waldens Creek Cabin Rental. Also on the main level, you will find a living room and bedroom and a half bath as well as a full bath. An ornate wooden spiral staircase leads to the upper level where you will find the game room and additional bedroom complete with A-frame bunk beds and an additional bath. Large windows offer views from every level! Enjoy absolute privacy from the deck and hot tub! The Last Approximate 1/2 Mile Is A Gravel Road. We Recommend 4WD / AWD. We had a wonderful stay at Waldens Creek. The cabin was beautiful and in such a serene setting but close to the busy attractions of Pigeon Forge. The only lay issue may be the steep driveway up to the house but not a problem for the Subaru. The staff of Great Cabins were lovely and accessible if needed. It was the easiest check in and check out I have ever had for a house rental. The place was very clean with loads of charm and lots of perks with the hot tub and the beautiful view and the pooltable and Wii for the kids! We would highly recommend both the cabin and their services. Management Response: Thank you for your review of Walden's View cabin. It was a true pleasure having y'all stay with us. We look forward to having you stay with us again in the future! We had a great time at Walden's View! It was a wonderful place to spend our Christmas. The cabin was very cozy and clean. We will definitely recommend this cabin and Great Cabins in the Smokies to all of our friends! Management Response: Thank you for your review. It was great having y'all stay with us for the Christmas holiday. We look forward to having y'all stay with us again in the future!! Management Response: Thank you for taking the time to review your recent stay at Walden's View. It was so nice having y'all stay with us for the Thanksgiving holiday. Yes, well water can hit a "sulphur" pocket and with that and the high iron content, it can give the water an odor. The cabin owner is having a new water filtration system installed next week. We were terribly sorry the system was not shipped in time to have it installed before your arrival. We look forward to seeing you all again in the future and thank you again for your review. We had a great time at this cabin! The view from the deck and hot tub is so beautiful. The drive up to the cabin is a little intimidating the first time but we got used to it by the end of our stay. We took advantage of the fire pit almost every night and loved being able to cook at the cabin with the fully stocked kitchen and propane grill. Would recommend this cabin highly! Management Response: Thank you for taking the time to review Walden's View. We are so happy you had a great stay and look forward to seeing y'all again one day! This cabin was fantastic! It was the perfect cabin for our family of 4. The view was amazing and the cabin was beautiful. The cabin was everything as advertised. We had a great experience in our first time renting from Great Cabins in the Smokies. The driveway is quite steep, so be prepared for that as you enter. Only reason I rated the location a 4...the National Park was 10-15 miles away. For those interested in Pigeon Forge, it is only 5 miles off the main strip. We enjoyed our stay at this cabin. Our kids really loved playing on the rock wall adjacent to the parking pad. The cabin was clean and provided a good view. Place was exactly as described. Cute and comfy. We had a wonderful time at Walden's View! Everything was just as described, very cozy, and clean. Driveway is a bit steep, but my little 4 cyl had no trouble getting up. The staff at the main office were very friendly and welcoming. The hot tub was not heating up when we arrived the first night, so we called the office on Saturday morning. They were quick to send someone out to get it going! We are definitely going to stay here again! This cabin is wonderful. It was nestled at the top of a beautiful mountain that was exactly what I wanted. It was in the perfect location, just far enough from pigeon forge for peace and quiet, but not too far to go have lunch in town. Also a super close drive into the smokies which is why we came. The cabin is wonderfully built into the side of a small mountain just near walden Stables which was the highlight of the family trip. If yi u want an awsome cabin and a ome peace and quiet..this is it. Thanks everything the website shows is acurate and they did a gr e at job with cleanliness etc. Get this place... it's awsome for a great get away. We enjoyed the cabin...great views, nice cabin, had everything we needed. It was raining heavily when we arrived and the road to the cabin was a little treacherous with the mud and gravel. The cabin could use a little deep cleaning, but overall we enjoyed our stay and would stay there again. Was very nice cabin loved it .... only bad experience is when I went to check in I was a late arrival and I had NO package or any information on where or how to get or get into my cabin.. I had to call several #,s to try and get someone to help after being at the hospital all day with a 43 yr old loved one with brain cancer and traveling 5 1/2 hours it was alittle frustrating but I understand things do happen and the problem was resolved very quickly once someone was contacted. over all it was a good place and stay ..
We were totally satisfied with our entire stay. This was our first time staying in this cabin,we were very pleased with the size of the cabin and the location. We stayed some days till 10:00 or 11:00 before we even left to go anywhere. I want to say a special thank you to Jamie & Marty for the extra effort they took to make our stay ENJOYABLE !!!! Management Response: Thanks Eric. Love hearing that everything was great for your visit with us! We needed a weekend away and this was a great cabin! The hot tub with the view was our favorite. The hot tub wasn't working when we got there but the management was easy to reach and quick to fix. We are planning next years trip. The cabin was just as pictured, a cozy, well equipped and well furnished. We found the bed very comfortable and thoroughly enjoyed building a fire every night after long hikes. Everything we needed and wanted for our stay. We absolutely love the cabin and the location.Everything that you could posstwantwas provided. Though it rained it only fed our desire to relax and read while enjoying the tranquility. We hated to leave. Management Response: And we really appreciate that you had a great time! Thanks for your wonderful comments. We had a great time. The view was beautiful, will be staying again in the near future. A great get away with plenty of comforts and fun. Wish I did something like this sooner. Great private cabin, perfect size for a family of four. Beautiful view. Loved the fire pit & hot tub. We were blessed by a week's stay at Walden's View cabin. We found the location to be perfect for exploring and viewing the Smokies while also providing access to the three nearby communities for restaurants and shows/shops. The cabin feels like you are living in the canopy of a temperate mountain rainforest. The cabin has a wonderful wrap around deck for relaxation. The inside of the cabin is beautiful with much to do. It could've used some attention to cob webs and dusting...but we assumed that the maintenance staff had overlooked this detail. Other than that we would stay at the cabin again the next time we visit the area. We were blessed to get away from challenges and the pace of life (if only for a short time) by Walden's View...you will be blessed too! I will forever remember the look on my husband's face when we pulled into the driveway. After the 14 hour drive from Tampa only taking backroads, no interstates and getting there at 10:45 pm, 6 hours after our original planned time it was a breathtaking experience. We weren't sure what we'd see. The pictures online do NOT capture the unique beauty and serenity Walden's View offers. I am still smiling ear to ear from the wonderful and magnificent memories this cabin created for our family. Management Response: Thank you so much for the kind words and lovely letter you sent us. We are truly honored to have been a small part of your happy vacation memories. Looking forward to seeing you and the family again! My wife and I really enjoyed our stay. Having the fireplace with plenty of stocked wood was nice for relaxation. Listening to the birds while enjoying the view from the hot tub was really peaceful. The bed was really comfortable. All the memories were good. Our only regret was that we did not stay longer.